Comcast Launches X1 Sports App with Help From Local Tech Co.
Get your sports geek on with the Comcast X1 Sports app. With the help of a 5-year-old Philly tech company, Comcast is launching the Xfinity Sports App for the X1 platform. It provides a plethora of visual sports info along the right side of the screen to help fans follow along with each game. Let’s take baseball for example. The app not only features the pitching match-ups and box scores casual fans are used to, but also strike-out percentages, hit zones and spray charts for the stat geeks. It kind of feels like ESPN’s GameCast but on your TV. The service is set to launch on Tuesday. There’s no extra charge. For Comcast, it’s the company’s latest effort to enhance the experience for cable subscribers and keep customers from cutting the cord. In fact, Comcast said in its most recent earnings call that it lost 8,000 cable subscribers in the most recent quarter. The company knows people are going to poke around on their laptops and phones while watching TV, but they hope the Xfinity Sports App provides a unique TV viewing experience that they can’t find elsewhere. “People have their computer, they’ve got their phone. We wanted to create a more immersive experience,” said Preston Smalley, executive director of product management for Comcast. For the project, Comcast teamed up with OneTwoSee, a 15-person Center City tech firm that creates interactive infographics for companies like Fox Sports and Comcast’s NBC Sports. Chris Reynolds, co-founder and CEO of OneTwoSee, said he’s “jazzed” about the app’s potential to enhance the user experience on their primary screen. With its deep pockets and status within the tech industry, Comcast could have partnered with any sports data company — and Reynolds knows he’s very fortunate. “Comcast really did take a chance on us when we were a two-person, three-person company and it’s been a mutually beneficial relationship ever since,” he said. Reynolds and co-founder Jason Angelides recognized the opportunity in visual, tech-based sports infographics. So they quit their tech jobs started the company from a house in Fairmount. OneTwoSee began working with Comcast in 2012 on some of the regional Comcast SportsNet channels. It also provides all the visual data on FoxSports.com. 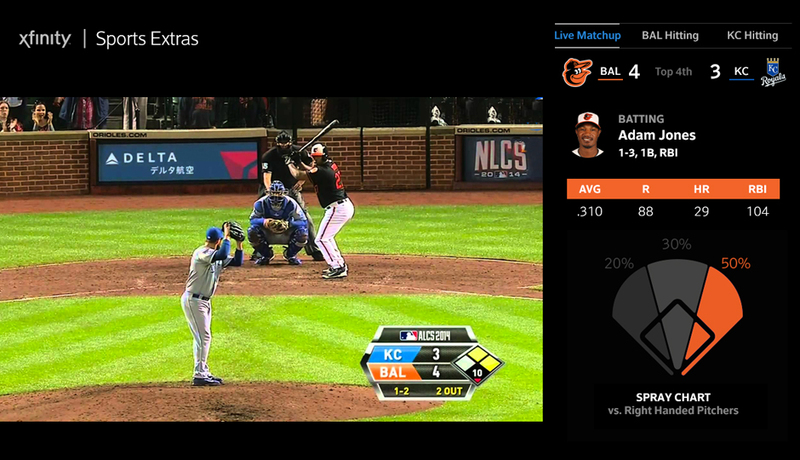 For the new X1 app, Comcast licenses the data for each league and it automatically aggregates to the platform via OneTwoSee’s technology. While you can’t watch highlights just yet, Comcast is looking into adding that functionality. “That’s definitely something that can happen in the future,” said Reynolds.